- Publisher With over seven and one-half million copies sold in the series, Left Behind: The Kids is a favorite of kids ages 10-14. Following teens that were "left behind," they have nothing left but their newfound faith in Jesus Christ. Determined to stand up for God no matter the cost, they are tested at every turn. - Publisher The best-selling Christian juvenile fiction series ever. Based on the megahit series "Left Behind", these books find four teenagers "left behind" after the Rapture. They become Christians, learn to depend on God every day, and come face-to-face with the most frightening thing possible: a challenge to their faith from the Antichrist himself. Over 5 million sold in the series. Boxed set. 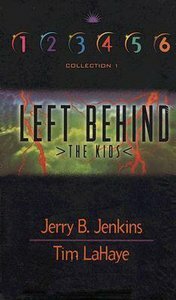 About "Left Behind the Kids Set 1 (Volumes 01-06) (Left Behind The Kids Series)"
With over seven and one-half million copies sold in the series, Left Behind: The Kids is a favorite of kids ages 10-14. Following teens that were "left behind," they have nothing left but their newfound faith in Jesus Christ. Determined to stand up for God no matter the cost, they are tested at every turn. Customer Reviews For "Left Behind the Kids Set 1 (Volumes 01-06) (Left Behind The Kids Series)"
Left Behind The Kids is an engaging series that is sure to engage young readers. The set is value for money as it has six books at a much lower price than buying six books aloneseparately. The books in the text coincide with some of the events that happened in the Left Behind series, linking characters from both series. The text of the books however seem very simple and simple, not going into detail and the books are small, and short, expect to finish the books soon!